When our breeding endeavor began, we were fortunate to have the opportunity to gain exposure and knowledge through contacts in both the United States and in Europe. Differing opinions are a staple in any community, and the Norwegian Forest cat lovers/breeders are certainly no exception to this rule. 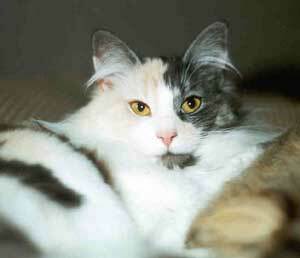 We have learned from observing breeding programs and participating in shows both in the United States and in Europe and have developed our own ideas about the Norwegian Forest cat, but our end goal is ultimately the same as breeders around the globe. Our philosophy is quite simple, taking into consideration all we have learned as well as what we have yet to experience. 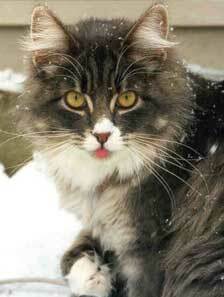 We breed for the preservation of this natural cat and for the joy of the breeding experience. Breeding isn't a hobby, nor is it a profitable venture. It is a serious responsibility requiring time, dedication and most of all ~ unconditional love. For this reason we plan on maintaining a small cattery so we can focus on the joys of raising "individual" kittens rather than "litters" and watching them grow into happy, socialized adults. 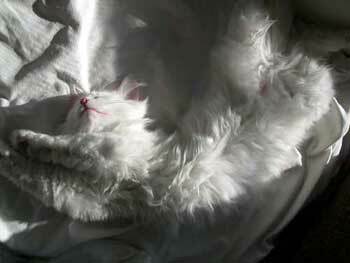 Our cats are our children, and their health and well-being are of primary importance. We are a cage-free cattery; both our kittens and adults are raised underfoot as members of our family. We do not rehome our adults once their breeding careers are over, nor do we allow our females to have more than one litter per year. 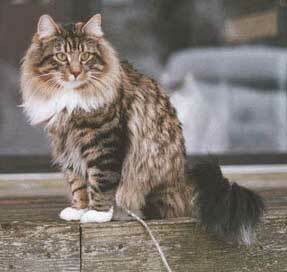 While we were once new to this beautiful breed, so are many others falling under the Norwegian Forest cat's spell every day. We consider ourselves both lucky and privileged to be in a position to breed these beautiful cats. One of the greatest benefits of breeding is watching one of your treasured kittens go to a loving home. It is our goal to find all our kittens a permanent home, where they will be treated as a member of the family, rather than just as a "pet". As you grow to love the Norwegian Forest cat as we have, either by firsthand experience or through photographs and commentary, you'll soon understand more of the magnetism the Skogkatt commands with his presence and personality. Once they've taken hold of your heart, you'll forever be under their spell. Winterfyre Cattery holds breeder memberships in CFA (NFC Breed Council Member), TICA (NFC Breed Section Member), and NFCFA. We are also members of No Dogs Allowed Cat Club (CFA) and Cat-A-Lina Cat Club (CFA). Our cattery is screened for FIV (feline immunodeficiency virus), FeLV (feline leukemia), PKD (polycystic kidney disease), GSD IV (glucogen storage disease IV) and HCM (hypertrophic cardiomyopathy). All white kittens are BAER (brainstem auditory evoked response) tested for hearing status before they leave our home. We do not work with the x-colors (cinnamon/amber, fawn/blue amber, chocolate and lilac).